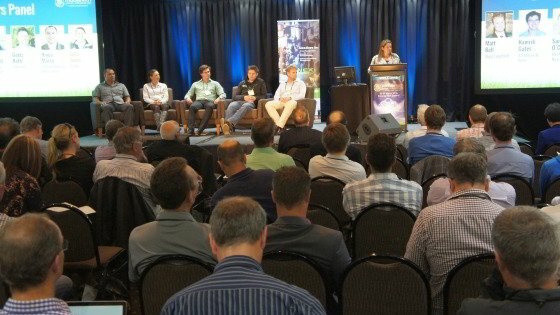 This year MobileTECH 2016 was held in Rotorua, New Zealand, on the 30-31 March 2016. Well over 320 industry representatives from throughout New Zealand and Australia packed the venue over two stimulating days. The aim this year was in better connecting the technology leaders and developers with the major operators and innovators within our food and fibre industries. This event was not for your average farmer with a passing interest in gadgets. This event attracted the very people who are shaping the technology future of the primary sector. MobileTECH 2016 featured 36 speakers and covered topics like rural connectivity, cloud-based platforms, automated tracking, mobile hardware, remote sensors, robotics, field capture tools, data management and satellite mapping. There were many key highlights during the two day programme. The Meet the Future Leaders Panel was a fantastic success. The panel included some of the brightest young people working within the industry and we heard them discuss their visions on how technology will power their businesses. The panellists included Matt Bell, Hamish Gates, Sarah O’Connell, Goetz Roth and Hinga Marsh. Julia Jones from KPMG also did an amazing job facilitating the discussions. The panel was so good that we decided to release the full video of the panel for public viewing. The video can be seen below. The TECH Talks was another new session added to MobileTECH this year. This session featured 14 innovative technology solutions in a lightening round of talks and panel discussions. We had companies like OnSide talk about their new health and safety app, Sprout highlighting their agri tech development programme, Aeronavics on new UAV applications and TracMap detailing innovations in vehicle GPS tracking and management. Our Keynote Speakers included Graham Smith (CEO of Federated Farmers), Ulrich Adam (Secretary General of Belgium based CEMA), Evelyn Seewald (GM Operations and Farmer Services, Fonterra), Yasir Khokhar (Founder of Netherlands based Connecterra) and Joshua Miller (Director of US based Farmshots). It is now clearer than ever that technology is set to deliver a massive step change in how our agriculture, horticulture and forestry sectors operate. We are moving on from the ‘simple’ data collection of the past and moving onto fully integrated decision support systems. In the near future a cow’s ear tag will not only record basic data, it will also track the cow’s eating and moving habits over time, compare that to the rest of the herd and report back to the farmer if there is a problem and recommend a solution. A grower will not only be able to use a UAV (drones) to take photos of the vineyard, they will be able to put on a VR headgear to actually see through the UAV’s ‘eyes’ while in flight. A digital overlay will take sensor data and show them, in real-time, where the problems areas are and what they can do. Development of next year’s MobileTECH 2017 has already started. This event will continue to innovate and provide an important platform for mobile technologies designed to increase productivity, streamline operations and build growth for the primary industry businesses.